FREE Report: Developing Stronger Fighters and Grapplers! In part 3 of this 3-part series, we are going to take a look at one of the most underrated areas of the body, the feet and ankle complex. Between the two they have 52 bones, that’s about 25% of your whole body! Between the feet and ankles, they have 33 joints and over 100 muscles! They are the first thing that makes contact with the ground when we walk, run, punch, kick, jump, shoot, etc. In other words, they are extremely important. Do not neglect the feet and ankles in your training programs. This is especially for athletes who perform their sport barefoot. I love the expression, “You can’t shoot a cannon out of a canoe”. For our purposes, I translate the “canoe” to be our bodies, starting from the ground (i.e. feet) up. The “cannon” will be our explosive strikes and attacks on our opponent. Build that strong foundation and you’ll be a much more efficient and effective athlete. I like to follow something called the, “Joint-By-Joint Approach” that was popularized by PT Gray Cook and coach Mike Boyle. 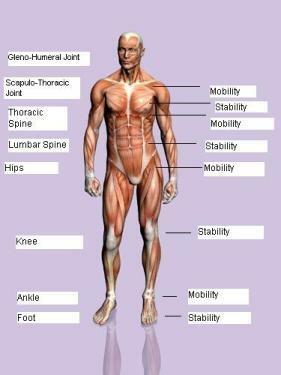 For the most part, it views the joints of the body in an alternating mobility and stability pattern. The ankle, hip, thoracic spine, and glenohumeral joint should be mobile while the knee, lower back, cervical spine, and scapulae should be stable. For the ankle joint, we want to restore/correct/maintain the proper range of motion… meaning we want adequate mobility. For many folks, especially combat athletes, ankles sprains and tweaks are quite common. If they simply “fight through it”, over time, scar tissue will form around the joint that will lead to decreased dorsiflexion. This function is extremely important in shock absorption during running, jumping, kicking, punching, and many of our typical daily activities as well. Understanding that everything is connected, we can begin to see how tightness in the ankle (limited dorsiflexion is common) can lead to a number of issues up the kinetic chain. Just because an athlete may have low back pain or knee pain, it’s possible that the ankle joint is a contributing factor. Instead of strengthening, mobilizing, and improving proprioception, the typical protocol is heavy taping and bracing. Research shows this can affect proper gait patterns and could lead to injuries elsewhere in the body. You can begin to see how important it is to have healthy, properly functioning feet and ankles. Strengthening the feet and incorporating joint mobility techniques are both essential for improving the health of the foot, ankle, and entire body. Above I shared with you some simple things you can incorporate into your sessions to help with the stability and proprioception of the feet. This video below will show you some stretches directed towards the flexibility of the lower leg musculature and ankle mobilization techniques directed toward the joint. Doug Balzarini, CSCS, MMA-CC, is the owner of DB Strength, which provides fitness training, education, and resources. He is also the strength and conditioning coach for Alliance MMA where he works with UFC Champion Dominick Cruz, Bellator Champion Michael Chandler, Brandon Vera, Travis Browne, Ross Pearson, Alexander Gustafsson, and more. Prior to starting his own business, Doug worked at Fitness Quest 10 as a personal trainer, strength coach, and Operations Director for Todd Durkin Enterprises (TDE).